A location thata��s endorsed as the a�?Scotland of Asiaa��, pilots coming in fr-om Russia, Romania and Switzerland, and temperatures that drop to as low as 5A�C a�� the 7th International Paragliding Adventure Carnival has plenty going on for it. 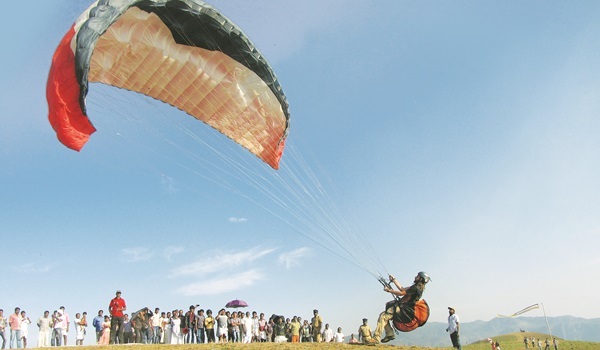 While the ongoing festival (February 21-March 1) is put together by the Kerala Adventure Tourism Promotion Society, Fly Vagamon, a 10-year-old paragliding club based out of the hill station, is organising the flights. a�?We have pilots coming in from across the country, including teams from the Indian Armed Forces and 15 pilots from outside the country. But there is no competition here. It is for both the paragliders and spectators to enjoy,a�? says Vinil Thomas, festival director and one of the founders of the club. When Thomas says a�?enjoy,a�? he means watching people float at heights of four to five thousand feet before sailing into the valley below a�� if youa��re too scared to sign up for a a�?tandem joyridea�� that is. a�?As long as you have no heart-related issues, injuries or high blood pressure, anyone above 15 can participate,a�? Thomas assures us, pointing out that while their oldest pilot is 70, they even had a 70-year-old civilian from Kochi sign up for a ride last year. a�?The pilot will take you for a ride that usually lasts 20 to 25 minutes,a�? he says, adding that one must be fit enough to handle the bit of running that is involved in taking off and landing. Being weather dependent, the sport starts anywhere between 11 am and 2 pm (depending on wind conditions), and winds up, latest by 6 pm, as the sun goes down. 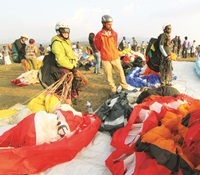 With a majority of the crowd (plenty of groups from the IT sector, wea��re told) coming in from Chennai, Coimbatore, Bengaluru, Hyderabad and of course, all over Kerala and bordering districts in Tamil Nadu, it helps that people can also indulge in some rafting and kayaking in beginner rapids located just 25kms from the festival site. And as far as accommodation goes, there are plenty of resorts and home stays just five kms from the site a�� a few even certified by the Kerala Tourism Department. If you miss the festival that lasts just nine days, Fly Vagamon also trains enthusiasts during mid-October to mid-November and the end of December till mid March.